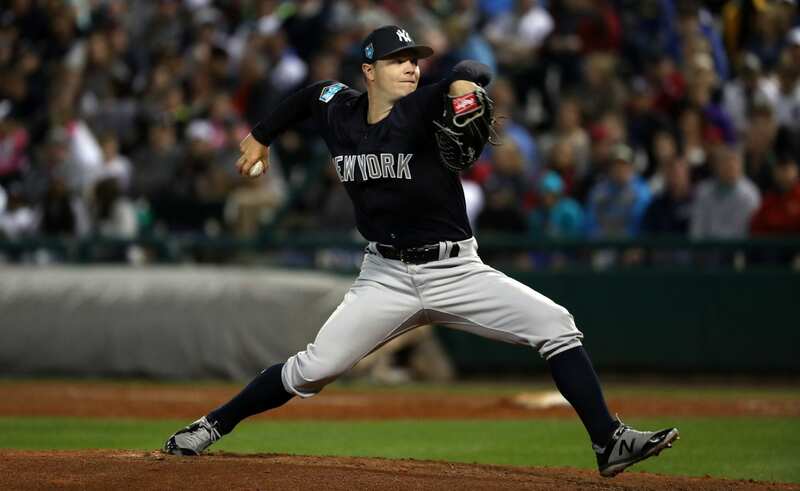 Sonny Gray was a player that whenever his name was brought up as a possible trade target, the New York Yankees were at the forefront of the discussions. The Yankees finally pulled the trigger to acquire Gray last season from the Athletics. Gray had a rough first season in pinstripes, but is a prime candidate for bounce back player of the year. Gray was born in Nashville, Tennessee. He attended Smyrna High School and was a fantastic baseball player. Gray was also a quarterback for the Smyrna football team. After High School he went on to play at Vanderbilt. Gray played three years for Vanderbilt and had his best season in his junior year. In his final season he led Vanderbilt to the school’s first ever college world series berth and made it to the semifinals. Gray was selected by the Athletics 18th overall in the 2011 draft. Gray made his debut in 2013 for the Athletics. In that season the Athletics made the playoffs and Gray pitched in two games for them. He made the A’s roster out of spring training in 2014 and made his first career opening day start. He helped the A’s make the playoffs again. Gray started the wild card game for the A’s, which they eventual loss. His best professional season was in 2015. He pitched in his first All Star Game and was third in CY Young voting. 2016 was a disappointment for Gray as he landed on the DL twice and finished the season with a 5.69 ERA. At the trade deadline last year the Yankees needed to add a starting pitcher as they were in the hunt for a playoff spot, and had lost Michael Pineda to Tommy John surgery. The Yankees made a deadline deal on July 31 to acquire Gray giving up top prospects Jorge Mateo, James Kaprielian, and Dustin Fowler. Sonny Gray turns in his best start in a #Yankees' uniform. Gray did not have a tremendous amount of success in his time with the Yankees last season. A majority of it was not his fault as the Yankees did not provide Gray with a lot of run support in his starts. Gray did help the Yankees make it back to the playoffs and pitched decently. In his first start, Gray was terrible as he walked three, gave up 1 HR, and allowed 3 ER in 3.2 Innings pitched. The Yankees pitcher rebounded in his second and final start of the playoffs against the Astros in game four of the ALCS. In five innings Gray only allowed 1 ER, 1 H and had 4 k.
Gray is destined for a bounce back year. Coming to New York can be challenging for players especially in the midst of a playoff race. Gray has the the benefit of having a full spring training with the bombers. This will play well to him and can benefit him in the long run. Gray is a pitcher who likes to get batters to chase pitches out of the zone which explains his high walk rate. If he can go back to his 2015 self, someone who attacked batters and did not mess around, he will be a strong number three option for Aaron Boone and the Yankees. Yankee fans should not give up on Gray as he is a pitcher who can be an ace or a great number two. He is a former All-Star and has all the tools to be a CY Young pitcher. I expect big things from Gray in his first full season in pinstripes.